Genius PreK is bringing their characters from the screen to the stage! Join Professor I.T. Peapod and his puppet friends as they work together with the audience to stop the pesky virus! Will Professor Peapod’s newest robot invention help? 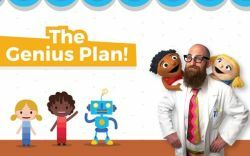 Can our friends Four and Five be transported back to the Genius PreK app where they live? There’s only one way to find out! Come prepared to learn, clap, stomp, shout, and sing along! This is a 45-minute show that touches on educational and socioemotional themes. It's perfect for children ages 4 to 6, and fun for the whole family.